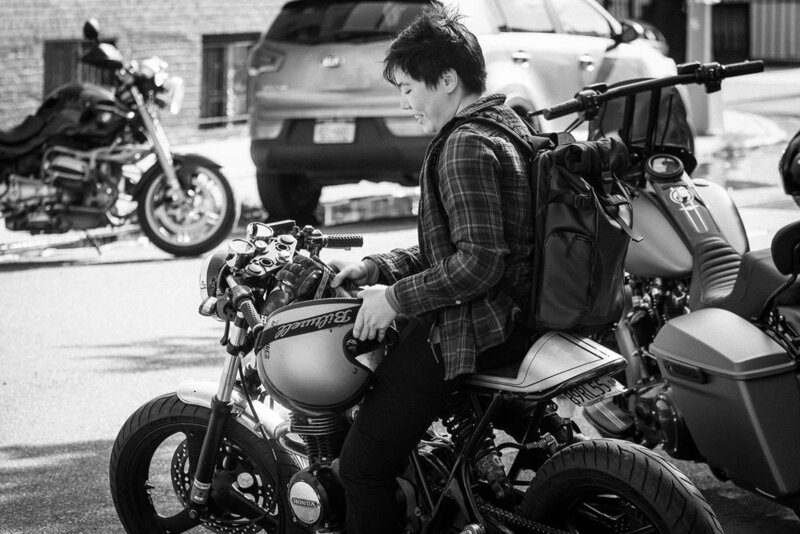 I pointed the motorbike North to attend an event by Basketcase Productions. Run by Girard Fox and Tim Warner, The Lot was hosted in a Greenpoint parking lot and featured vintage bikes, custom bikes, and even some modern rides. And also some really great music. I first met Girard at The Race of Gentlemen. A true lover of motorcycles, Girard spent ten years rebuilding a 1922 Henderson that he races (and which was on display at the show), and he also has a pristine 1942 Harley-Davidson Panhead. Check out the video to see both bikes. This was the fourth event put on by Basketcase Productions, and the first I was able to attend. It was a rough ride from Philadelphia to New York (there are zero backroads into NYC), but well worth the trip. It's always a pleasure to have the company of people who love motorcycles as much as I do, and The Lot didn't disappoint. It was well attended by friendly bikers, including Triumph rider, and vocalist extraordinaire, Julia Haltigan. There were plenty of interesting bikes to see, as well as some vintage cars. Pulling off an event like this that works well is no easy task. But Girard and Tim made it look easy. I can't wait to see what Basketcase does next.